Q. 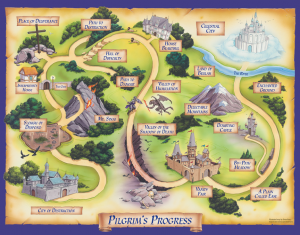 Why publish a children’s version of The Pilgrim’s Progress? A. This is the most faithful version to the original by John Bunyan, at an age-appropriate level for children who are learning to read or who read well. Children will meet some of the most unforgettable characters in literature as they also learn about the Christian life through this brilliant and exciting allegory. Q. What age group is the book designed for? A. Ages 6 to 12, but adults will enjoy it as well when they read it to their children and grandchildren. Q. What is the purpose of this version of Pilgrim’s Progress? A. To prepare children for the whole of the Christian life, its ups and downs, its challenges, its joys, as well as to teach them essential truths of the gospel and give them a deeper understanding of Christ’s work in the life of a believer. Q. How can I find out more about the Pilgrim’s Progress curriculum? A. You can download a free lesson and learn more here. The 13-lesson curriculum for elementary children (grades 2–6) includes a teacher manual, children’s activity pages, music, and dramatic reading of the storybook with different voices for each character! Order here or by phone at 800-695-3387. You may also email us at curriculumspecialist@gcp.org. Q. Can I use the curriculum as VBS? A. Yes! We have a lot of ideas for how to organize it here. Q. I purchased a Deluxe Classroom Kit. Where is the digital code for my free downloads? A. When you purchase a Deluxe Classroom Kit, you have access to digital downloads. Log in to your account at www.gcp.org and click on the Digital Downloads tab in My Account. Downloads expire 120 days after ordering and items may be downloaded 5 times. Questions? Problems? Call 800-695-3387 or contact us here. Q. How will the book and curriculum teach children about the gospel and prepare them for living out their faith? A. It will teach them the necessity of believing in Christ alone, studying God’s Word, depending on the Holy Spirit, and learning from other believers. It shows them that the Christian life is a pilgrim’s journey filled with joys, love, provision, distractions, difficulties, doubts, and so much more. Q. Doesn’t John Bunyan’s story contain words that children won’t understand? A. Yes, Bunyan wrote an allegory—a story with two meanings. The people in the story have “character names,” words that describe what they are like. These words might be unfamiliar to young readers (for example, Ignorance, Evangelist, Pliable, and more). Q. Why produce a hardback book? A. The original, beautiful illustrations and faithful text make this storybook a treasured keepsake that will last throughout a child’s life. Q. Is there an e-book version or paperback? A. Not yet, but we are working on it. Q. How will a child keep up with Christian’s journey since he travels to so many places? A. A large map is inside the front cover of the book, making it easy for children to follow along as Christian travels from the City of Destruction to the Celestial City. Q. Why should I buy this storybook? A. It is a wonderful gift for any child. But more important, the reading of this book equips parents, grandparents, teachers, caregivers, and more with a child-friendly vocabulary to explain the work of Christ and discuss important biblical truths to every pilgrim, whether young or old. A: Great Commission Publications published Pilgrim’s Progress. GCP is a ministry based in Atlanta, Georgia—best known for Trinity Hymnal and Show Me Jesus, our Reformed Sunday school curriculum for ages 2 through middle school. We also publish So What? youth Bible studies and have VBS, catechism materials, and more. We would love to partner with your church to glorify God in your children’s, youth, and adult ministries. Click here to learn more.